A quick lunch for a lazy Saturday. Great way to use up the CNY cashew nuts too. Roughly chop garlic and nuts. Add the herbs and chop rather finely. Transfer to a mortar and pestle (in batches) and grind/pound until desired smoothness. Transfer into a bowl and mix in salt, parmesan and about 2 tablespoon of extra virgin olive oil. Taste and add more salt if necessary. Lightly press down the pesto to slightly compactify it. Add more olive oil until it just cover the pesto. Cover the bowl in cling wrap and keep in the fridge until ready to use. 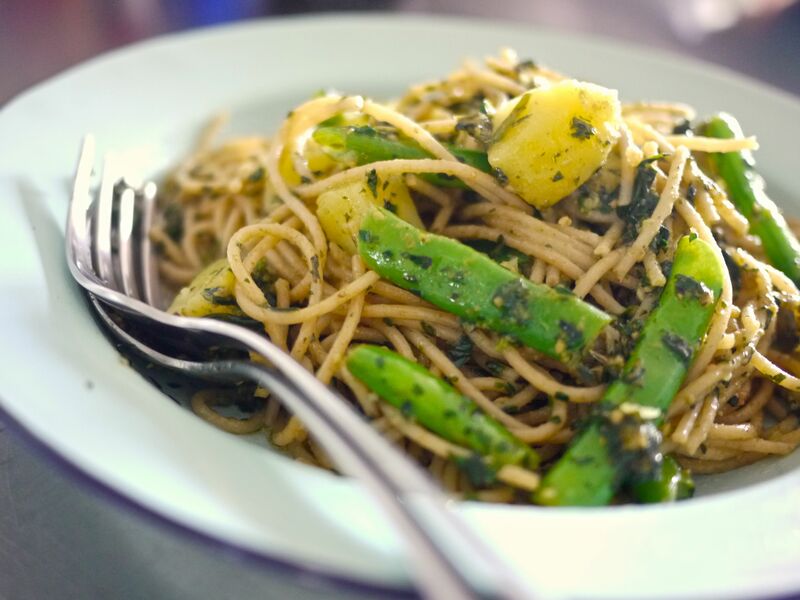 This entry was posted in Cook and tagged cashew nuts, pasta, pesto on February 23, 2013 by three3seconds. I never thought that teriyaki sauce can be home made. I know, what can’t be? Erm, so it’s not supposed to be those thick salty kinds the Japanese food stall auntie slather over my over baked salmon? Oh it’s actually very nice! Yummy! Mix all ingredients in a small saucepan and heat but do not allow to boil. Stir to dissolve the sugar. Reduce until the desired consistency is reached. For the dish below, i first made a loose sauce for marinate, and further reduce it to thicken for final glazing. Preheat oven to 220 deg Celsius. Wash ingredients and pat dry with kitchen towel. Arrange on baking tray and smear on loose teriyaki sauce. Turn the fish over and smear the other side as well. Let the ingredients sit for 15 minutes before putting into the oven to roast for 12-15 minutes. While the fish and all is roasting, thicken the teriyaki to almost caramel consistency (be careful not to burn it! it will further thicken as it cools). Plate the dish and apply teriyaki glaze on the ingredients and plate. 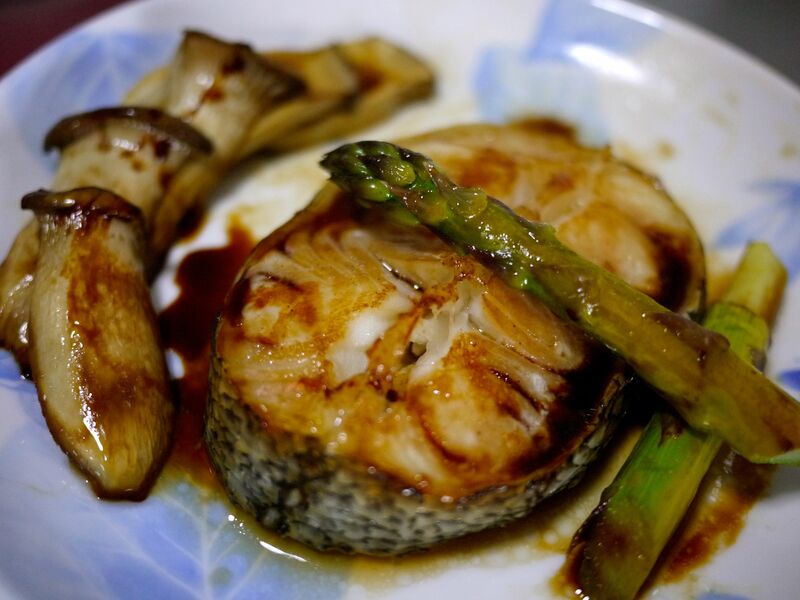 This entry was posted in Cook and tagged cod, Japanese, teriyaki on February 21, 2013 by three3seconds. I love oats. I might have said this before. But I really do. I love the smell of uncooked rolled oats. I love the taste of cooked oats and I love the texture oats add to cookies. I may be the strange one around, many people turn their noses away from oats, it is more like a get-well food but really it isnt! Add some nuts, fruits and you have quite a delicious meal. It’s good that oats as a galactagogue, is great for me! More excuses to nom nom nom! Preheat oven at 180 degrees Celsius. Beat the sugar and butter until creamy. Add egg and vanilla and beat until blended. Whisk together the oats, flour, almond meal, baking soda, spices and salt. Add to the butter and egg mixture and beat on low speed until just incorporated. Stir in the chocolate chips. To make mini cookies, use 2 teaspoon and shape walnut-size balls of dough (roughly 1 heaped teaspoon). Bake for 10 minutes or until your desired doneness. Makes about 75 mini cookies. This entry was posted in Bake and tagged chocolate, cookies, oatmeal on February 6, 2013 by three3seconds.